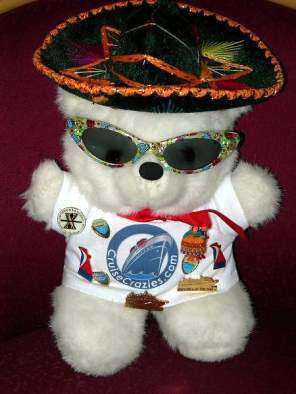 Meet Crazie Cruiser: The Cruisin' CruiseCrazies Mascot! She takes up little room, is quite the conversation piece, and is always ready to cruise on any ship with any type of accommodations. It's very simple: Take her along, buy a ship's pin or a pin from one of the ports, take pictures of her around the ship and in port, and mail her back within 5 days of your return home. All of Crazie's cruise reservations and travel arrangements are coordinated for you. The opportunity to take Crazie Cruiser on your next cruise is on a first come, first serve basis so if you're interested, contact us and reserve Crazie Cruiser for your next cruise!